I arrived in California on Thursday before the race – I don’t always have the best luck traveling, so I didn’t want to fret about getting to the Expo and picking up my packet on the same day I was traveling. After checking in to my hotel, I decided to walk the half-mile to a nearby grocery store to pick up some supplies for the weekend. Have I mentioned that I’ve been struggling with blisters throughout my long runs? And that I thought I had finally conquered them during my last long run. Yeah, well, I was done-in by that 1-mile round-trip to the grocery store…new blisters! Ugh. Oh well…nothing to do, but bandage them up and move on. But I felt pretty dumb. Next morning was the Expo. Good thing I hadn’t planned on doing anything else on Friday, because there were LINES! Once the Expo opened, it didn’t actually take too long to get my bib (and Kirsten’s bib, since she wouldn’t be able to pick hers up before the race on Sunday). After that, I walked the floor of the expo, and found a couple places to spend some money (of course!). Last thing up was to pick up some of the official merchandise….oof. 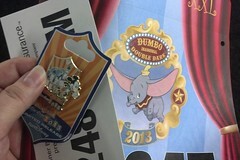 I picked out a couple of shirts and few Dumbo things, and went to find the end of the line. And then I waited. And waited. And waited. And waited. I got to hear some of Jeff Galloway’s talk, and some chick from Biggest Loser (hate that show with a burning passion), and then Sean Astin. I also chatted with a woman in front of me, which was, frankly, more interesting than the talks. After about 2 hours in line, I finally got to the front of the line. We probably should have gotten finisher medals for the merchandise line…no lie. I laid low for the rest of the evening – watching movies in my hotel room and grabbing an early dinner before heading off to bed early. The alarm was set for 3AM, so no reason to stay up late! As usual, I slept like crap worrying about whether or not I would get up on time, about finishing the race, and about finding the start. 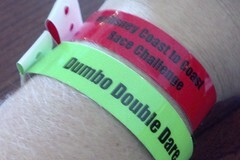 I must have dozed off at some point, because I dreamt about getting to the race. In the dream, I was there on time, but had forgotten my shoes in the car (even though I wasn’t driving in real life). 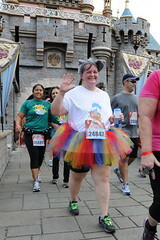 I went to get my shoes and then got distracted at the theme park while getting back to the start. Perhaps it’s just as well that I didn’t sleep much more. The alarm went off at 3AM like it was supposed to. I looked at the weather first thing, and it was still 77* – at 3AM (!). Nothing to do but go out, so Jo and I got ready for the race. 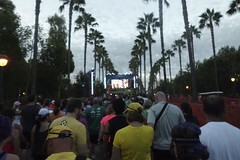 I left the hotel around 4AM, and walked toward the start. I wasn’t completely sure where we should be going, so I found some other racers and followed them. 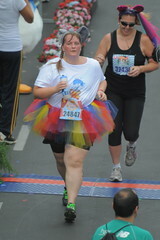 The 5k race was happening before the 10k, and I got there early enough to hear them call away the 5k runners. While waiting, a lady approached me to see if I knew where we needed to be. She and I got to chatting, and waited to be called to our corrals together. We were also in the same corral, so Rosemary and I stuck together as we walked over to the corrals. 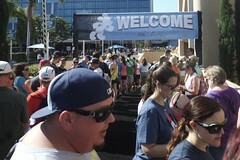 I will say that the corrals for the 10k were not as well organized as they were for the Walt Disney World half marathon. Rosemary ended up pulling me into a corral. When I started asking if it was ours, she said, “Just stand here and act like nothing’s going on.” Honestly, I was just as happy to be in an earlier corral, so I shut my mouth and waited for the start. Finally our corral moved toward the start. It was still 77* out. But at least today was the short race, right? And we were off. Since I was in an earlier corral, I felt free to stop a little on the way to grab a couple of pictures. 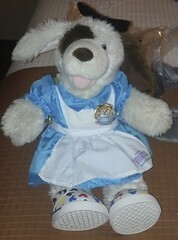 We spent a bit more than a mile on the streets of Anaheim, and then moved into the Disney parks. 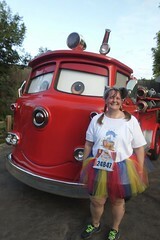 We ran through Radiator Springs first, and I stopped for a picture with Red, the fire truck from Cars. Along the way, I was running my miles for different people. 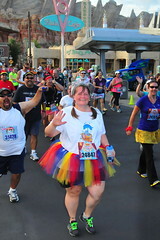 Through the parks, most of the miles were for the kids in my life. My nieces got the mile that include Radiator Springs, which is appropriate since my middle niece was in love with Lightning McQueen for a long time. 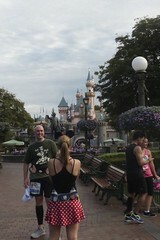 My youngest nephew, my best friend’s son, had the mile that took me into Disneyland. And Sweetie had the mile that took me through the Castle. I did my run-walk for about the first half of the race, but it was hot and humid and I was feeling like I was giving everything I had to keep that up. Knowing that I had a second race to get through and that I had gotten into an earlier corral (so I didn’t have to worry too much about being swept), I walked most of the rest of the race. I didn’t want to use up everything. I had enough left to run across the finish. 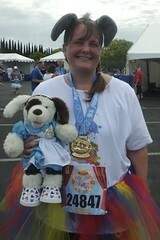 …6.2 down, 13.1 to go!